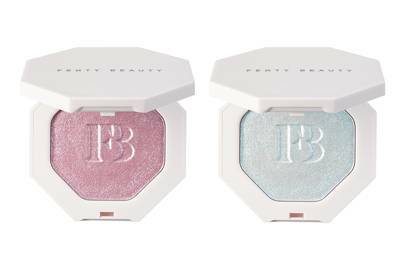 Fenty Beauty sure know how to excite us and the latest product drop at Harvey Nichols has us seriously swooning. Rihanna has not only blessed us all with one new Stunna Lip Paint shade but THREE. Plus, the brand has just released two gorgeous new highlighters at the same time too. So, first the lip paints. One of our favourites has to be Unlocked – it’s Glamour-pink, the kind of hot-cerise that will make Barbie proud. Then there’s Unattached, a gorgeous spring-ready coral modelled on the Pantone Colour of the Year and lastly, Undefeated, an aubergine ‘sultry purple.’ All three shades are £19 each. 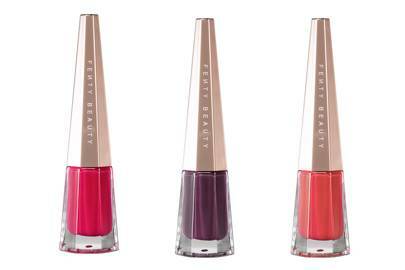 The Stunna collection, for anyone not clued-up, are Rihanna’s long-wearing liquid lipsticks. They’re all about pigment, lots and lots of pigment, and won’t leave your lips feeling desert dry. If you’re looking for statement lip colour, you NEED to try them. With your lips painted to perfection, you’ll want to work on your glow which is where the new highlighters come in. The two new Killawatt Freestyle Highlighters come in two pastel-like shades; Wattabrat, a shimmery baby pink, and Chillz, a baby blue. The new additions make up the collection of six different glows – from peachy sunsets to metallic golds. The highlighters each cost £28.